This Multiple Monitor Mount Will Ship Today When Ordered Before 1pm EST (M-F)! The Best Selection of Affordable TV Stands Can Be Found Through This Site! Shop Online and Order a Multiple Monitor Mount Now! Aluminum design fastens flush into wall stud! 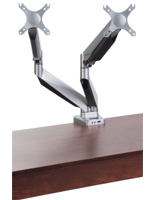 Articulating arms enable users to position multi flat panel screens to any angle! Dual brackets allow customers to rotate screen from vertical to horizontal orientation and tilt display appropriately! A multiple monitor mount, like this quality flat panel design, can be positioned parallel to the frame of wall at any visible, appropriate height to display and communicate information! 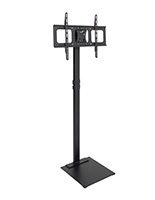 Without the arms or components attached, this mountable stand measures 52"w x 10-1/4"h x 2-3/4"d and can support a television measuring up to 24" on both arms (maximum load capacity is less than 33 lbs.)! This multi screen wall rack, multiple monitor mount that can show dual images pivots and rotates to adjust flat panel presentations to any realistic position! Before users attach an LCD display to each support, an M6 Allen wrench (included) must be first inserted into the top of each arm, the end closest to the bracket post. This instrument must then be placed inside the unit with the curved handle outward. When the tool is rotated to the left about 2-3 turns, the spring-loaded coil releases a bit, which allows for up and down movement of the arms. (Please Note: If flat panel is fixed to bracket and arm prior to completing this step, the device cannot be adjusted. Modifications must only be made with all parts detached so make sure this step is completed for all supports first!) 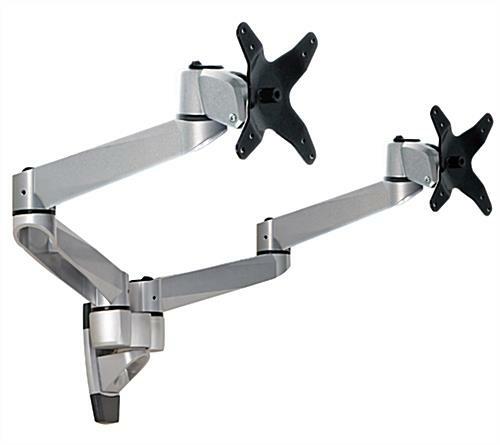 This innovative LCD wall bracket, multiple monitor mount that has articulating arms can also be angled in opposite directions to take full advantage of the visibility of any digital material presented on the screens! These features are extremely valuable and are appreciated by all! 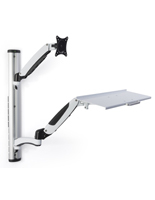 This dual display holder, multiple monitor mount that is used in commercial and residential settings is a realistic purchase for anyone! 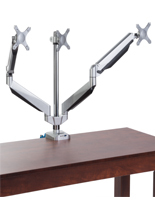 Airports, casinos, offices, retail stores, laboratories, medical facilities and homeowners all use this stand uniquely! Although this bracket fastened to a wall and is commonly used for amusement and viewing purposes, this design can be used near a desk and connected to conventional PC tower. 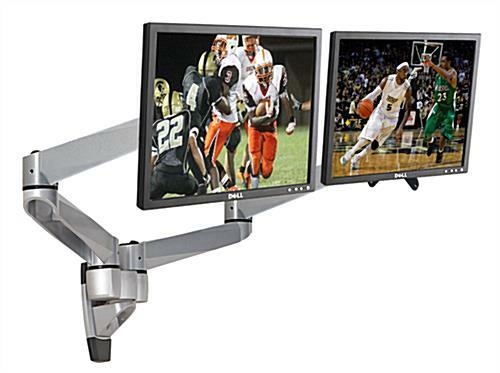 In order to utilize tables or rooms with minimal space effectively, this multiple monitor mount supports dual flat panel computers simultaneously and can be a valuable, reasonable addition to any environment! Those who have purchased one of these wall design models have resourcefully situated LCD display arms in portrait or landscape arrangement depending on the nature of use! A multiple monitor mount used for tidying up desk spaces can actually help to boost productivity and maximize potential significantly! This stand is also offered in other countertop configurations as well so make sure you check out the entire collection! 52.0" x 10.3" x 2.8"